Gear up for the 22nd Annual CRUISIN’ CAR SHOW in Morro Bay, coming this May 3rd through 6th. Summer starts early here as this event showcases all the best of the season. Find bliss in the warm sunshine and salty ocean breeze, accompanied with a cold beverage and hundreds of hot rods to explore. Here are some tips to maximize your fun when you arrive. The Car Show kicks off on Thursday, May 3rd and will fill the streets with dozens of glittering one-of-a-kind vehicles for the entire weekend. However, if you want to get a glimpse of downtown before the road is blocked off, arrive earlier in the week. Morro Bay will be buzzing with gorgeous classic cars all week long. Come see them in action! Take advantage of your Spring Passport, as you will have access to 11 deals exclusively for hotel guests. These deals will lead you to some of the most delicious and/or exciting places to be downtown! With the cars stacking up the streets, its best to stay in a nearby hotel and take a short stroll to the show. Most hotels are walking distance to Morro Bay Blvd and Main St, the two primary streets for the show. It is best to book your hotel room early before they are all reserved, especially hotels on the waterfront or right next to the car show. To find a hotel room that fits your needs, click HERE. Unlike any other, the Morro Bay Car Show hosts more than 500 beautiful vehicles for a 4-day period with the beautiful bay and Morro Rock as the backdrop. The days will go by quickly and there is much to do. Be sure to make a game plan for your visit. 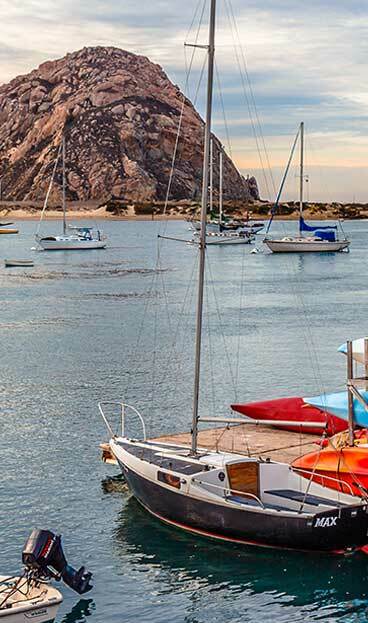 Feel free to check out the MORRO BAY VISITOR GUIDE for some inspiration.